Coastal Maine Restaurant Week coming up soon! The Coastal Maine Restaurant week kicks off on April 26th and runs through May 2nd. Participating restaurants stretch from Ogunquit to Kennebunkport. It’s a nice way to sample old favorites, or try out a new restaurant! Each restaurant is offering special prix fixe menu: $25, $35 and $45. There are several in the Kennebunk’s this year giving foodies a nice variety of options. On the Marsh is one of our favorite restaurants. This beautiful restaurant sits on the marsh (hence the name) in beautiful gardens just outside Kennebunk’s Lower Village on Western Ave. (a 10 minute drive from our Inn). Lots of parking. Charming, quiet atmosphere is perfect for special occasions. We love to start with their Artisan Cheese and Meat Tray for Two. It’s served with several different cheeses, a lovely prosciutto and the duck roulettes are delicious. The accompaniments vary from season to season, are artistic and compliment the meat and cheese perfectly. For the main course, doesn’t matter if you like seafood, meat or are vegetarian. All of their meals are cooked to perfection and are beautifully presented. We can’t encourage you enough to try this restaurant if you haven’t been already! If you fancy a more lively atmosphere, Federal Jacks in Lower Village is the place to go. This local’s favorite tavern features their Shipyard beers that are hand-crafted at the Kennebunkport Brewing Company (located just below the restaurant). Federal Jack’s sits on the river with great views over the water and marina. Offers traditional pub grub. They are open year around. They have several TV’s so great for keeping an eye on the games as well as pool tables. Beer not your thing? They make a pretty good margarita too. Ask about getting your own tankard at the bar – a great reason to keep coming back! Mabel’s Lobster Claw caters to those seafood and lobster lovers. Located on Kennebunkport’s scenic Ocean Ave., this seafood diner has been a staple in this village for 60 years and is also a favorite with the Bush family. You can dine inside or at one of the outside tables. Mabel’s is open for lunch and dinner. They buy their lobsters fresh off the pier from local Kennebunkport lobstermen. 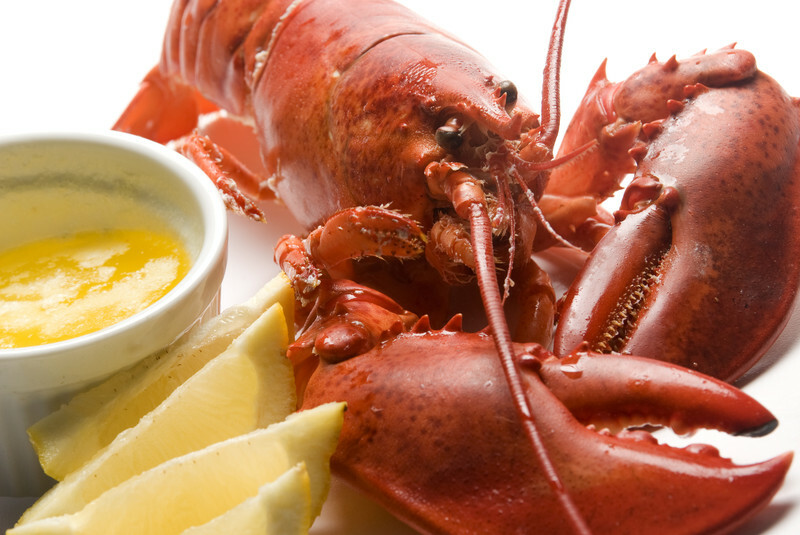 If you’ve never eaten a whole lobster, don’t panic. In addition to the plastic bib, their placemats give you a step-by-step guide in how to eat it! And if you want to really go for the full on experience, order the Baked Stuffed Lobster which is loaded with Maine scallops. In addition to their lobster specialties, they offer soups, salads, clam chowder, pasta, sandwiches and meat entree’s. Truly something for everyone. Save room for the blueberry pie made with wild Maine blueberries. We still have rooms available for restaurant week so if you’re feeling the spring fever and want to treat yourself to a quick getaway, we hope to welcome you soon!